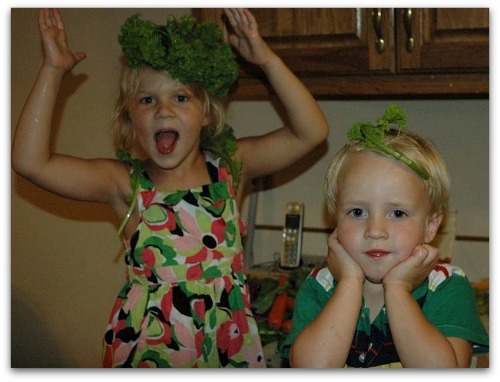 I don’t make it a secret that I was a very reluctant homeschooling mother. When my husband mentioned homeschooling eight years ago, I thought he was a crackpot. Thank goodness I listened to him. 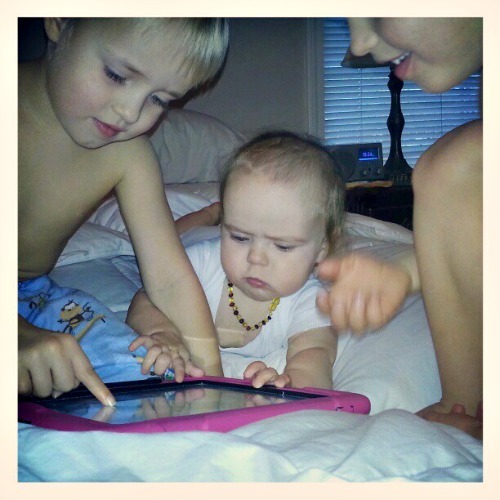 As we begin to wrap up our second year of homeschooling, I’m amazed at how much my children have learned. Even more amazing? The lessons they have taught ME. We chose to take our twin boys Adam and Thomas out of the local preschool this year. The plan was to teach them at home, just like I was doing with Rachel. I thought I could teach a precocious first grader, rambunctious twin preschool boys, and manage a new baby. All while managing a household and working outside the home. On paper, I’ve been a failure. The preschool lesson plans and workbooks I poured over in late August are unfinished. The boys can’t write their names, but they can rattle off a dozen species of dinosaurs and tell you about their herbivore/carnivore status. They struggle with a pencil grip, but will sit by the creek and watch tadpoles and worms for hours on end. 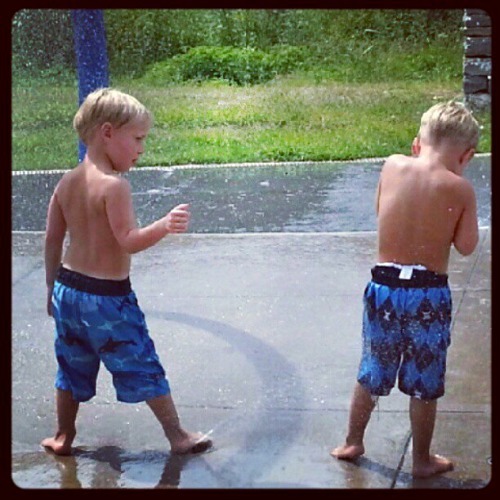 Check out the lessons I’ve learned while teaching my identical twin boys this year. It’s no surprise to my friends that I’m an impatient person. I’m a jump to action kind of girl, with a choleric spirit. Trying to teach a little one how to hold a pencil while nursing a baby has been a challenge for me. At the end of many days, I’m on my knees, asking for grace, patience and a forgiving spirit. It’s a lesson in humility for me to attempt to figure out how to explain concepts to little boys as they jump around my living room. Once Rachel learned to read, there’s been no stopping her. She KNOWS she’s a good reader, and doesn’t need me to tell her. My boys aren’t as confident. I’ve heard ‘I can’t do this!’ many times from them this year. I have to encourage them again and again. My boys are still young. Much of our day is playing, balanced with life skills and chores. My boys both hate to write, so teaching them letters and numbers has been a bit of a challenge. I’ve given up (for now) trying to teach them a proper pencil grip. Instead we work a lot with scissor skills, lacing beads, pegboards and writing with chalk. I’m amazed at what the boys have picked up, just by sitting near Rachel while we work on science lessons. They hear much more than I give them credit. Years ago, storytime with my twins was pretty torturous. They would chatter, grab books or hang upside down off the bed. As they’ve gotten older, storytime is my favorite part of the day. Brett takes the children to the library often, where they check out DOZENS of books. 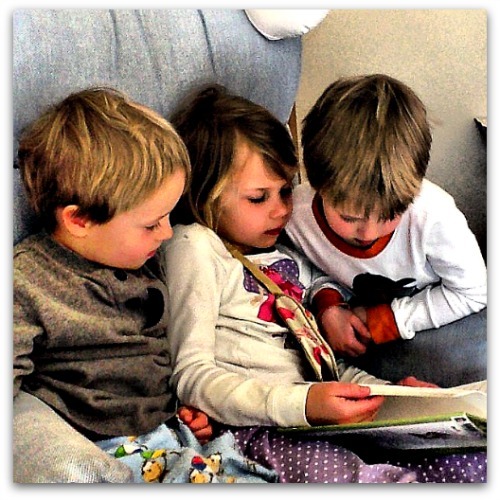 They sit engrossed in stories for an hour, no matter if it’s Alice in Wonderland or How to Train Your Dragon. This shouldn’t have come as a surprise to me. My guys are simply not built to sit still in a desk. When we do school, all the kids spread out on the floor and do their work. I’m also careful to work with them in short bursts, giving them plenty of time to run outside and burn off steam. Thomas surprised me one day. That took the wind out of my sails. 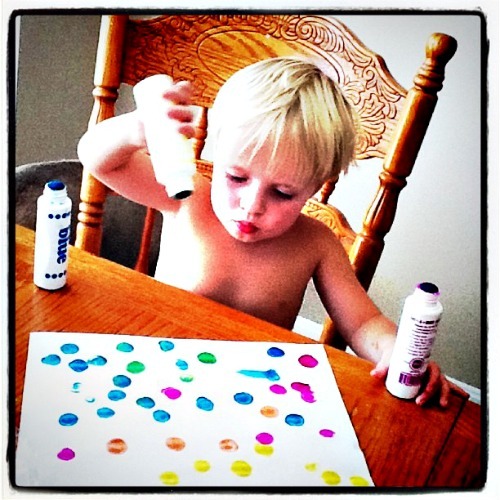 It’s time for me to get my act together and add crafts into our routine. Even though I’ve second guessed myself so many times, I know that homeschooling our children is the best decision for our family. By being able to spend more time with them, I’m blessed with being able to learn them. 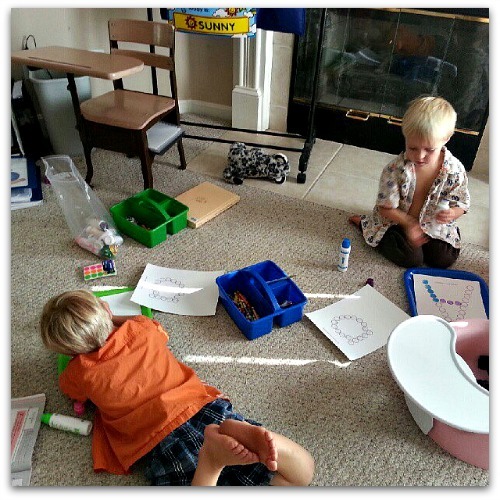 Our days homeschooling are loud, messy and chaotic — I wouldn’t want it any other way. 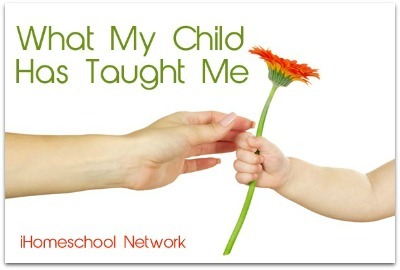 Be sure and visit my friends over at iHomeschool Network for all the ways they’re learning, right alongside their children. I love this. 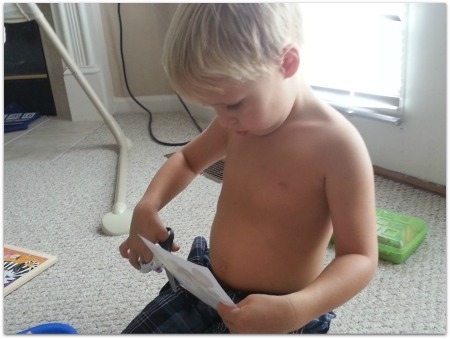 Just like you, I was shocked at just how differently little boys learn, and just like you – a model student – I have been amazed time and time again at how circular their learning is, as opposed to my very linear way of approaching things. Kudos to you for tailoring it to what they need. 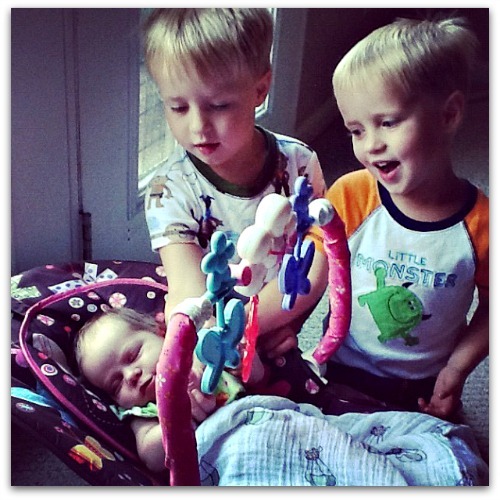 I’m glad this post made sense to you — I know you get it, as a recovering control freak (in a good way) and momma of rambunctious boys. This is an amazing ride we’re on. Your boys sound a lot like mine and your daughter like mine, except my boys are the older ones. I’ve found anything that gets my boys moving is great for learning, we act out a lot of lessons. Movement is fine …. but now I just have to figure out how to corral them into sitting back down once we work out the wiggles! I’ve only been homeschooling for a year and a half now, but it took a whole year to find something that worked for my boys. Now that we’ve found things that work, they’re doing amazing. That’s not to say we still don’t hear complaints now and then, but I’m happy and their happy, so it’s a win win situation. 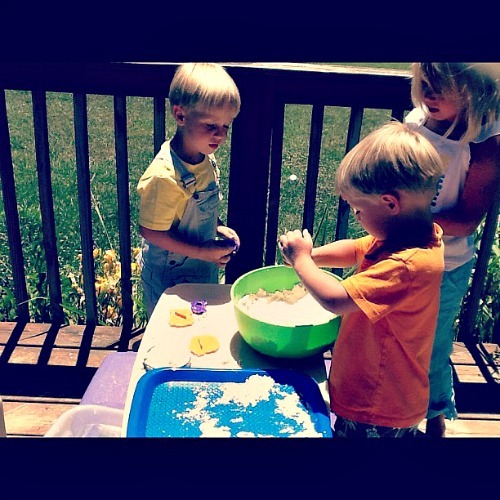 Feel free to check out all of our fun activities at http://everystarisdifferent.blogspot.com. I’m not a fan of crafts, but I am a fan of making everything hands on so my boys. Good luck! I just hopped over to your site and was blown away by your human body study! How awesome!! I’ll be emailing you — I know all of my wee ones would LOVE that! Oh, how I identify with so many things that you said here. I’m not a patient person either. And they don’t learn like I did. Nodding my head to the fact that they’re never, ever still. This is an encouragement to me, you have no idea. I’ve second guessed a lot of things this year, related to our homeschool. Thanks so much for sharing this. Hang in there with the reading, Erika. My youngest daughter is 15 months, and I can’t get through a board book with her without her throwing it out of my hands. I don’t talk so much about being a twin momma now, since I survived the first few years! If you check out the twins category, you’ll find lots and lots of posts there. Oh my gosh, I love this post. My twin boys are now 10, and I have 12 year old and 8 year old girls. I work from home, in a corporate job, and we are in our 3rd year of homeschooling. It is really beyond words most of the time, which is probably why I haven’t blogged in more than a year. But I love having them home and together, and I’m so happy I can homeschool them. I love this, and am glad I clicked through. But on the craft thing, which I loathe, do yourself a favor … once or twice a month is PLENTY… think Sunday School, Storytime, that favorite sitter, grandparents … let those who love it, lead the way! You are awesome – and what you write is THE TRUTH. 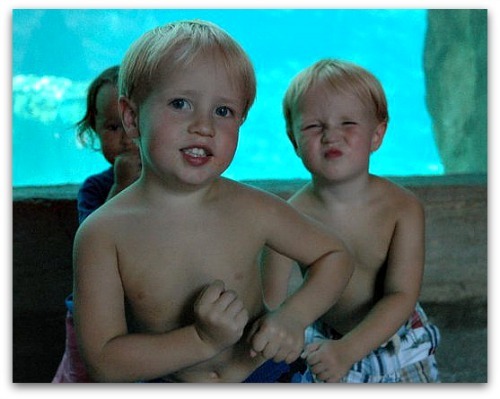 I have identical twin boys that are almost 8 and another 5 yo boy. We also homeschool – and I about cried when the first thing on your list was about patience … And then continued to chuckle, smile and nod my head through the rest of the list. 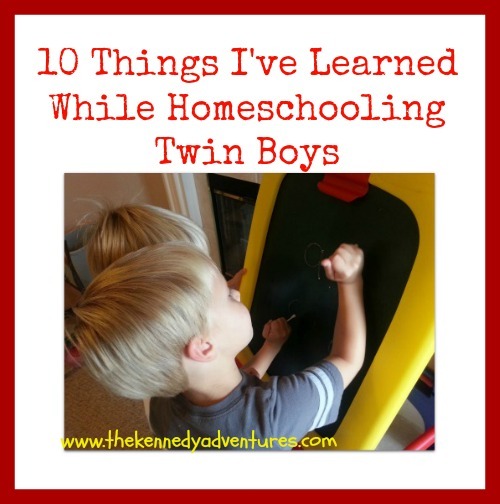 Homeschooling my boys has been so much different that I thought it would be – but like you, I wouldn’t trade the experience for the world. Stay strong super mama! I learned so many of these same lessons, especially the impatient one. It was my 1st year of home schooling too. I’m just saying my prayers that next year will be easier. Oh, Jennifer, you made me laugh! Is it silly to say ….. I don’t know what grade they’re in? AAACK. Reading is a struggle, so they’re somewhere end of K – beginning of first? Math is a DREAM — they’ll finish up the 2nd grade math by Christmas and go on to third grade. So, I’m splitting the middle and calling them 2nd grade! Slow and steady wins the race, sweetheart. You’ve got this. Plus, they’re still young. (Have a 4yo now, too, and my youngest is 2) Lots and lots of reading aloud, and a little bit of math and handwriting are golden. My goodness, this is so relatable. Especially about learning that people don’t learn the same way as you. I was personally in the same boat as you–model student, always organized, always overly prepared, didn’t forget any assignments, etc. It’s such a struggle to remember that others are often not the same in this aspect, and creates unnecessary frustration. This is a good reminder!